When you settle down with a ChocLit book you know you are in for a romantic read, with a gorgeous hero and not a few bumps along the path to true love. Too Damn Nice delivered in all these respects and I enjoyed reading it immensely. Nick Templeton has worshipped Lizzie Donavue from afar for years, being her big brother’s best friend. She views him like another brother doesn’t she? Well, Lizzie may have harboured similar feelings for Nick but neither have quite managed to let the other know. On her 18th birthday, just when Nick had decided it’s now or never, Lizzie announces she’s got a top modelling contract and is off to New York! It seems they just aren’t destined to be together. Fast forward a few years, during which Lizzie has suffered a family tragedy and become a world renowned model, Nick comes to her rescue following some particularly lurid tabloid headlines. Kathryn Freeman has created a lovely character in Nick, one who I think I may have been just a bit in love with! Yes he is the nice guy, steady, reliable with the so called boring job – a safe option perhaps. But he is also so considerate and sensitive and willing to do anything to make sure his beloved Lizzie is happy, even if it means putting his own happiness on hold. It seems that nice boys do kiss like that and for all the celebrity relationships Lizzie may have had as a top model in New York, no-one has made her feel like Nick. The chemistry between them was apparent every time the two were near each other. I seem to have focused on Nick rather a lot – can’t think why! Lizzie was also a very likeable character who, despite her huge fame and success, seemed quite down-to-earth. I found her to be infuriating at times and was practically shouting at the book: just tell him how you feel would you! The grief she felt following her family tragedy is sensitively portrayed throughout the book as is her horror and humiliation at the scandal she finds herself at the centre of. Did I finish the book with a contented sigh and a smile on my face? Well of course I did, but to find out how the story of Nick and Lizzie gets to that point, you’ll need to buy the book for yourself! 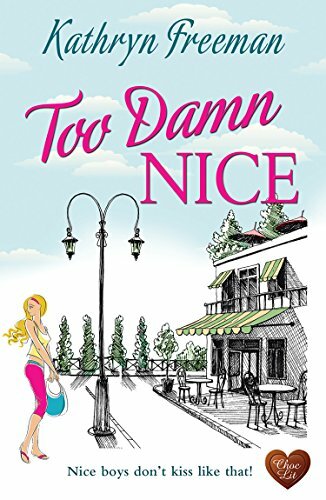 Too Damn Nice is a thoroughly enjoyable read, perfect for when you want a feel good read and a happy ending.